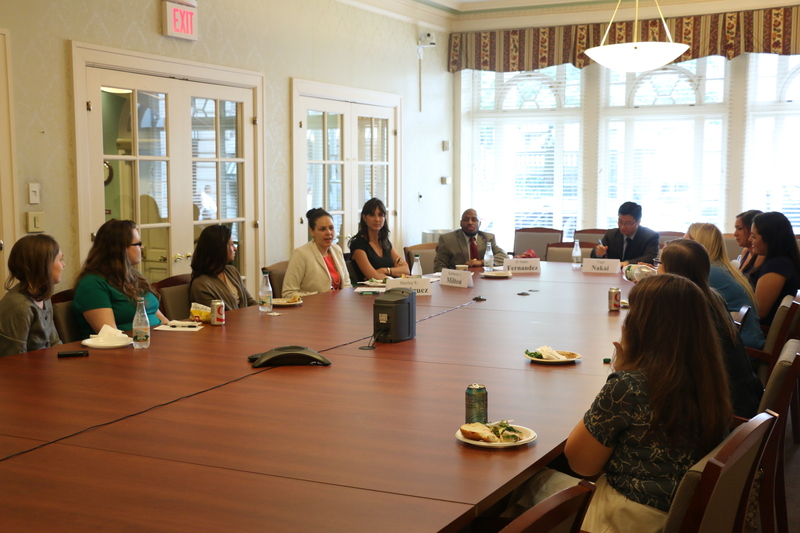 Law students and new attorneys learned about legal service careers at last week’s Career Series Lunch. Last Thursday, new lawyers and law students gathered at 16 Beacon to get the inside scoop on what it’s really like to work in legal services as part of the BBA’s Summer Career Series. Attendees gained insight from attorneys of diverse backgrounds with years of legal services experience, asked questions about the profession, and learned tips on how to pursue a career in legal services. Panelists also recommended pursuing volunteer and pro bono opportunities at various organizations as a means of identifying areas of law they are interested in pursuing professionally. Yugo Nakai and D’Andre Fernandez, both attorneys from the Volunteer Lawyers Project of the Boston Bar Association, shared stories about the types of cases they handle and offered tips on how to deal with these clients, whose circumstances offer a unique and often challenging experience. Katharine Milton, an attorney at Casa Myrna Vazquez, emphasized that because legal service organizations do not have extensive support staff or large budgets, working in legal services calls for patience and resourcefulness. Sherley Rodriquez, an attorney working at a fellowship program through Suffolk University Law School, further emphasized the importance of making positive connections with other attorneys in legal services who will remember you further down the line when more opportunities and positions open up. Interested in attending a Career Series lunch? Check out the final lunch called “What’s it REALLY Like Being a Real Estate Attorney?” tomorrow at 12:30 pm. Stay tuned for more career series programs in the fall! The PILP ’10 Class worked to develop materials for the Edward W. Brooke Courthouse’s Court Service Center to help bring further access to justice in Massachusetts. Over the last several months, PILP 10 has been hard at work developing materials for the Edward W. Brooke Courthouse’s Court Service Center (CSC). The culmination of their hard work was a meeting last week with Judge Dina Fein (Massachusetts Housing Court, Western Division) and Access to Justice Coordinator Erika Rickard (the Massachusetts Trial Court) to discuss their project and to hear how the Commonwealth can best serve unrepresented litigants. Before we get to that meeting, here’s a little background on PILP 10’s project. This class spent the past year drafting materials for the Edward W. Brooke Court Service Center (CSC). The CSC will have a grand opening later this summer. It was created with the hope of being a central court hub for self-represented litigants. Visitors to the Brooke Court can go to the CSC for clarification on forms needed for legal action, connection to existing legal and social services, and language translation assistance. The PILPers put together materials and resources to help the staff and volunteers most effectively serve self-represented litigants. Additionally, as part of their project, the class will be hosting a brown bag program in September to discuss the workings of the CSC and how BBA members can get involved. Of course, Beyond the Billable will keep you up-to-date on program logistics. “It was incredibly rewarding to hear about how our work has been utilized by the Court Services Center so far. I also thought that Judge Fein and Erika Rickard were fantastic advocates for the CSC program and their enthusiasm made us all the more committed to support the new CSC and serve as a resource in any way we can.” — Caroline Simons, Fish & Richardson P.C. Stay tuned for more on PILP 10’s CSC project. 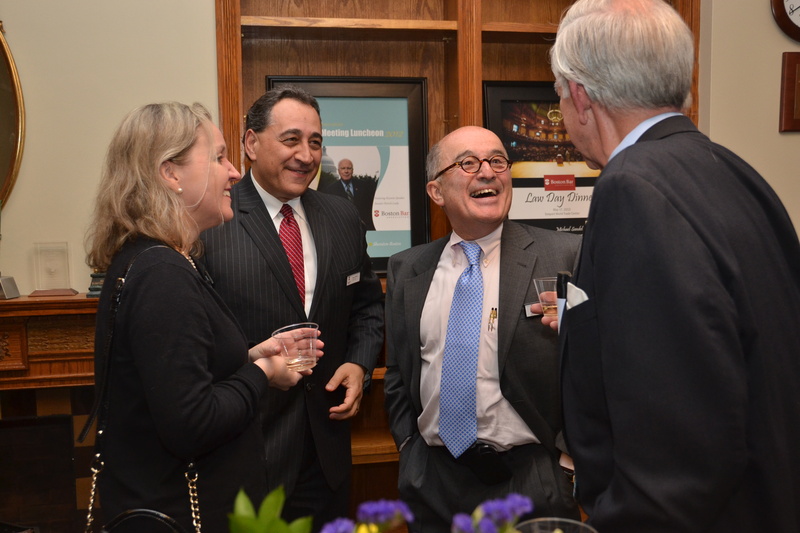 In April, members of the Society of Fellows were invited to an exclusive Spring Fellows reception to honor their contributions. While our readers know about the Boston Bar Foundation’s impact in our community, you may be less familiar with the group of people who make this work possible—the BBF’s Society of Fellows Program. The Fellows are a community of philanthropic lawyers dedicated to advancing the BBF’s mission of increasing the availability of legal help to those in need, supporting innovative legal services projects and programs, and providing meaningful ways for lawyers to connect with our community. We’ve noticed amazing growth from the Fellows Program since the beginning of this year, so we crunched some numbers to calculate how the Society of Fellows impacts the BBF. This year, 100 percent of the proceeds from Casino Night will be dedicated to the BBA’s Summer Jobs program, helping to provide paid summer employment for Boston teens. In addition, the upcoming Passport to Pairings event (formerly Justice is Sweet) will be dedicated to funding the full portfolio of BBA public service programs. The BBF devoted $300,000 in Adams Benefit proceeds this year to legal service grants that advance access to justice for those in need, including immigrants, victims of domestic violence and low income children and families – a need that continues to grow as IOLTA funding continues to decline. The BBF is only $1.4 million away from its long-term goal of $5 million for the endowment, which will provide invaluable long term support for the BBF’s efforts. If you are interested in supporting the BBF’s public service, find out more about joining the Society of Fellows here. Take a look at the current list of fellows here. Don’t miss out on the Boston Bar Foundation’s newest event, Passport to Pairings, next Thursday! Not only will the event be fun and delicious, but 100% of the proceeds are going to a great cause all of the—BBA public service programs! The event will feature gourmet food and beverage pairing stations celebrating the BBF’s partnership with the BBA. Some of the Pairings stations include sushi & Saki, craft beer & gourmet hot dogs, artisanal donuts & specialty coffee, and much more. Each ticket gets you access to deluxe food & beverage stations, beer & wine, live music and our raffle, so don’t miss out on all of the fun! 23 pro bono trainings trained nearly 600 attorneys to take cases ranging from special education appeals to veterans benefits. 64 Boston public high school students were placed in summer internships in local Boston law firms and offices through the BBA Summer Jobs Program. 1,300 Boston public school students learned about the importance of voting through our annual Law Day in Schools program. 18 schools state wide received Financial Literacy Training in the M. Ellen Carpenter Financial Literacy Program’s 10th year. 275 calls were fielded from active duty military members and veterans since the BBA began hosting the Veterans helpline in September. Continued to assist individuals and businesses that were affected by the tragic events on Marathon Monday in areas, including employment and tax issues. Since the program began last year, 84 attorneys have helped over 70 individuals and small businesses owners. Convinced? The event will take place on Thursday, June 26th at 6pm at 16 Beacon Street. Buy your ticket today to the maiden voyage of this event and help us continue to grow our public service programs! Panelists Deborah Allen, Boston Public Health Commission, Emily Armstrong, Beth Israel Deaconess Medical Center, and Bill Sinnott, Former Corporation Counsel for the City of Boston, discussed how the marathon preparation enabled the City to respond quickly to the unexpected events of April 15th. As many of our members know, the BBA is hard at work preparing for the largest bench bar event in Massachusetts, Law Day Dinner 2014, which will take place on May 12th at the Boston Convention Center. While a keynote speech from Mayor Marty Walsh will headline the event, Beyond the Billable is particularly excited for the BBA to recognize the lawyers that stepped up to provide pro bono legal assistance following the tragic events of last year’s Boston Marathon.The BBA Marathon Assistance Project volunteers will receive a special award at Monday’s event, honoring them for their willingness to donate their time to help the city, its businesses, and its people rebuild after the bombing. If you’re an avid reader of Beyond the Billable, you’ve probably seen the stats, but here they are once more just for good measure: over 200 individual lawyers, along with 26 law firms, and 3 law schools mobilized to provide critical legal assistance. Lawyers were uniquely qualified to lend their expertise in a time of crisis, and our volunteers agreed to do so at a moment’s notice. It’s important to note, however, that the process is not over. As the One Fund prepares for the second distribution of applications, the BBA and our outstanding volunteers stand ready to offer assistance with One Fund claims, and additional legal issues that continue to arise. Just last week at 16 Beacon, we heard from a panel that included a representative of Beth Israel Deaconess Medical Center, the Former Corporation Counsel for the City of Boston, a member of the Boston Public Health Commission who discussed how preparation for the marathon itself enabled the City of Boston and other service providers to respond so quickly to the events of April 15. Events like this remind us that the work is not yet finished, just as the one year anniversary of the marathon reminded us that even as we remain Boston Strong, the healing process for the city and the victims is still far from over. If you would like to provide pro bono legal assistance through the Marathon Monday Project, please contact Katie D’Angelo, Public Service Programs Coordinator, at kdangelo@bostonbar.org. Find out more about the BBA Law Day Dinner, the largest annual bench bar event in Massachusetts here. Liam Lowney, MOVA’s Executive Director opens the conference with remarks about the 30th Anniversary of the Massachusetts Victim Bill of Rights and the federal Victim of Crime Act. The BBA Lawyer Referral Service (BBA LRS) kicked off a the season of community outreach at the Massachusetts Office for Victim Assistance’s (MOVA) 2014 Victim Rights Conference in honor of Victim Rights Month in Massachusetts and National Crime Victim Rights Week. Last Friday’s conference brought survivors and victim service providers together at Seaport World Trade Center for a day of learning and networking via multiple workshops and exhibits. As an exhibitor, the BBA LRS spread the word about the services of the program to the conference attendees. In addition to highlighting the LRS and its reduced-fee panels, the LRS table had information about special projects for those affected by the Marathon Bombings, and the Military Legal Helpline. If you would like more information about the Lawyer Referral Service please contact Solana Goss at sgoss@bostonbar.org.